Thanks for the love, Staten Island! 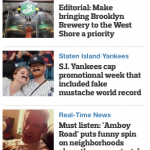 I was pleased as punch today to see myself on the front page of the Staten Island Advance website! A link calling my song a “intimate”, “humorous”, and a “must listen” (!) leads readers to a write-up of “Amboy Road”, my new song about the South Shore of Staten Island. If you haven’t already, go here to read more about the story behind “Amboy Road.” Thanks again, Staten Islanders!